We have a complete specification for the PlayStation 3 Slim, which was officially announced earlier today at Sony’s GamesCom Press Conference. The new model features 120GB hard disk drive whilst being significantly slimmer and lighter, with reduced power consumption. Available in stores the week of 1st September 2009, the new PS3 will be priced at €299. The current PS3 will also be reduced to €299 from 19th August 2009. Firmware 3.0 will be released on September 1st to coincide with the launch of the PS3 Slim. The PS3 Slim also has a vertical stand which is sold separately. The OtherOS feature has also been removed, so you can no longer run Linux or other operating systems on the PS3. The reduction in power consumption also means there is a reduction in fan noise, and hopefully this also means a reduction in temperature. Tokyo, August 18, 2009 – Sony Computer Entertainment Inc. (SCE) today unveiled the new PlayStation®3 (CECH-2000A) (body color: charcoal black) computer entertainment system, featuring an extremely streamlined form factor with a 120GB Hard Disk Drive (HDD). The new PlayStation®3 (PS3®) system will become available in stores from September 1, 2009, in North America, Europe/ PAL territories and Asian countries and regions at a very attractive recommended retail price (RRP) of US$299 and €299, respectively. The system will become available in Japan on September 3, 2009, at a RRP of 29,980 yen (including tax). With the introduction of the new PS3 system, SCE will also reduce the price of the current PS3 with 80GB HDD to a RRP of US$299 from August 18 and €299 from August 19. Also in North America, the price of PS3 with 160GB HDD will be reduced to a RRP of US$399 from August 18. By launching a vast library of exciting and attractive software titles for PS3 this holiday season and offering customers a line-up of hardware models and pricing to match their preference, SCE will build on the momentum and further accelerate the expansion of the PS3 platform. The internal design architecture of the new PS3 system, from the main semiconductors and power supply unit to the cooling mechanism, has been completely redesigned, achieving a much slimmer and lighter body. Compared to the very first PS3 model with 60GB HDD, the internal volume as well as its thickness and weight are trimmed down to approximately two-thirds. Furthermore, power consumption is also cut to two-thirds, helping to reduce fan noise. While inheriting the sleek curved body design of the original model, the form factor of the new PS3 system features a new meticulous design with textured surface finish, giving an all new impression and a casual look. With the compact body and casual appearance, the newly introduced model will appeal to a wider audience who are looking to buy the best entertainment system for their home. Concurrently with the release of the new PS3 system, SCE will modify the PS3 brand name from “PLAYSTATION 3” to “PlayStation 3”, and introduce a new “PS3” logo, which is engraved on the surface of the new PS3 system. By unifying under the familiar “PlayStation®” name, which represents the entire PlayStation family, PS3 together with PlayStation®2 and PSP® (PlayStation®Portable) will further expand the PlayStation business, and will continue to enhance the entertainment experience along with the ever-growing PlayStation®Network. The new PS3 continues to offer the cutting-edge features and functions of the current models, such as the ability to enjoy high-definition Blu-ray disc (BD) movies and games, as well as various content and services downloadable through the network. The new PS3’s storage size has increased from 80GB to 120GB, and with the extra capacity users will be able to store more games, music, photos, videos as well as various content and services available through PlayStation Network. Having more than 27 million registered accounts around the world, PlayStation Network offers more than 15,000 pieces of digital content, ranging from game titles, trailers, and demos to more than 15,000 movies and TV shows via PlayStation Store*1. PlayStation Network members can also download free applications, such as PlayStation Home, a ground-breaking 3D social gaming community available on PS3 that allows users to interact, communicate and share gaming experiences, as well as Life with PlayStation, which offers users various news and information on a TV monitor in the living room by connecting the PS3 to the network. Since the launch of PS3 in November 2006, the number of BD-based titles has reached more than 1,000 titles and downloadable PS3 games to 1,400*2 titles worldwide, with the support from a broad range of third party game developers and publishers. In addition to this extensive software title line-up, exciting and attractive new titles are to be released from SCE Worldwide Studios, including Uncharted 2: Among Thieves, EyePet, Ratchet & Clank Future: A Crack in Time, Heavy Rain, God of War 3, MAG, ModNation Racer, Gran Turismo 5 and more. 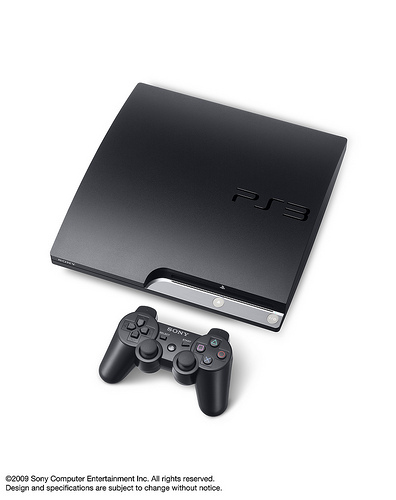 Concurrently with the release of new PS3, system software will be upgraded to version 3.00 on September 1. The update adds various user-friendly features such as the “What’s New” screen, where users can quickly browse the new items available in PlayStation Store as well as their recently played games directly on the XMB™ (XrossMediaBar), with short cuts to each piece of content. PS3 will evolve continuously with the system software updates, further improving the operability and enhancing the user experience available through the network. PS3 owners will be able to enjoy new features by simply updating the PS3 system software to version 3.00 via the “System Update” function on the XMB*3. The new PS3 system is also equipped with the BRAVIA® Sync™ feature. By connecting the new PS3 system and a BRAVIA TV with the HDMI cable, users are able to directly operate the XMB on PS3 using the TV remote control. Other functions include “System Standby” that will automatically turn off the PS3 system when the BRAVIA TV is turned off*4. By utilizing the separately sold “Vertical Stand”, users will be able to set the new PS3 in vertical position*5, making it easier to place the PS3 system anywhere at home. The vertical stand will become available in Japan on September 3, 2009, at a RRP of 2,000 yen (including tax) and in North America at US$24*6. Along with a vast line-up of attractive and exciting entertainment content with the new PS3 system, SCE will continue to further expand the PS3 platform and create a new world of computer entertainment. *1 Number as of end July 2009. Content within PlayStation Store will differ by region, please refer to the official PlayStation.com site for further details. *2 Includes PS one® classics and free of charge content (downloadable demos). *3 Users will need to connect their PS3 to the network to use the function. *4 Users will need to use BRAVIA TV that supports the BRAVIA Sync feature. For further information about BRAVIA Sync, please refer to the official Sony site in each region. *5 Users will need to use the separately sold “Vertical Stand” to set the new PS3 in vertical position. i was very curious to know about slim one but knowing after it’s specification i am happy with my old 80gb. At least i can run Linux on it. It is a shame Linux is no longer supported ! With the “Fat” model people built whole clusters of PS3 making up small supercomputers. Not many scientists or enthusiasts will buy the new model now. Looks like the new one is only a TOY. I think Sony should become part of the Open Source revolution if they want to survive in the long run. Supporting Linux was an unique selling point of the PS3 and now when it is gone I am afraid many fans from the Penguin camp will be very dissapointed. I have read the the PS3 slim is is two thirds of the size of the original. Not exactly slim then? Definately not as slim as the ps2 slim was to the fat ps2. There is really not that much of a difference in my opinion between the slim and the older one.